The average date of the first fall frost ranges from mid-September to early November. 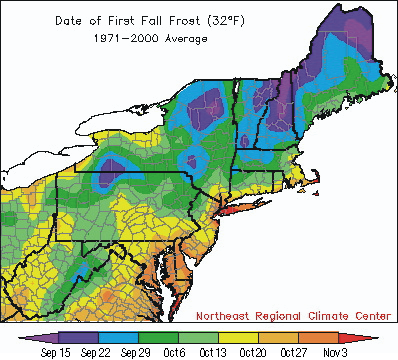 As shown above, the average date of first frost for the northern half of the region is October 6. This fall, only a few areas in New York, northern Vermont and New Hampshire, and most of Maine have seen frost as of that date. A similar situation was in place in 2008, but during the third week of October, a cold air mass brought a quick end to the growing season in the Northeast.